Since 1913 we have been specializing in designing fine art, and we continue to create one of a kind pieces for our customers. This solid wood, four panel front door is no exception. Handcrafted from solid solid timber, using mortise, tenon joinery, each door is handmade by our master craftsmen. Our custom doors are handcrafted using hand hewn peg and dowel structure to ensure these custom entrance doors stand the test of time. 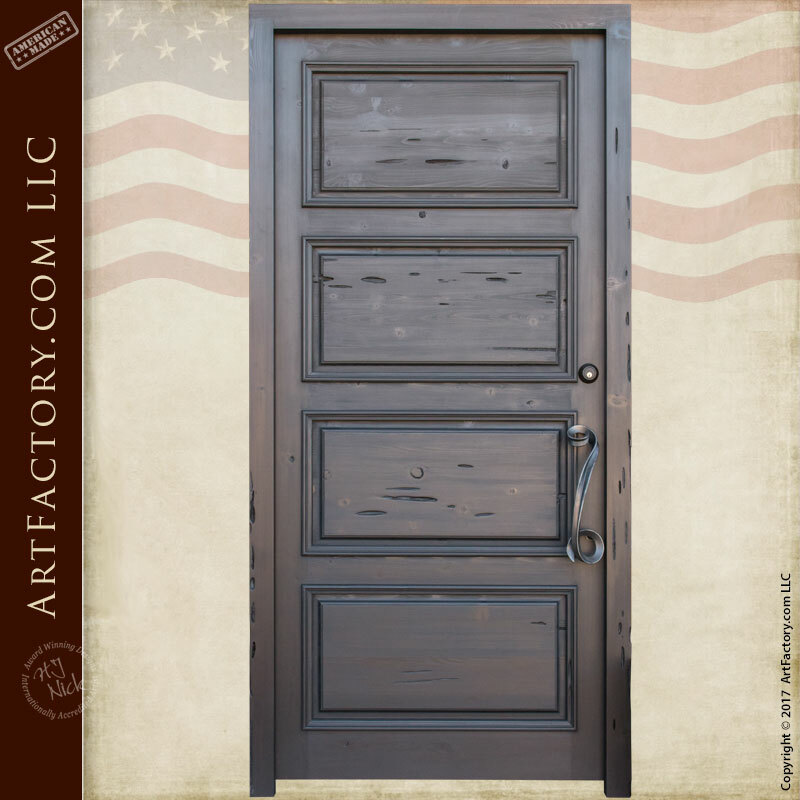 In other words, when you buy a custom door from ArtFactory.com, it is built to be the last door that you will ever have to buy. All of our custom made doors are finished with a multi-step hand rubbed process for a virtually maintenance free finish. These finishes are blended into the grain of the wood, and will not fade, flake, or chip like painted on finishes. Our door hardware is available in a variety of styles and finishes and always hand built to your specifications by our master blacksmiths. Using tried and tested methods, centuries old. Hand forged wrought iron, anvil hammered and patina finished ensure that your custom door pull will never erode. Award winning artist H.J. Nick designed this custom made door for luxury and security. Wanting the beautifully finished four panel front door to have a unique touch, he added the double S scroll wrought iron door pull (Door Pull DHHF900). Thus, giving this sleek custom door a solid, modern embellishment. All of our custom hardware is made to your exact needs, never feel limited as to what you can have for your handmade door. Call us for a custom door quote today at 1-800-292-0008.